Grain-Free French Toast Sticks | Whole Food. Real Food. Good Food. 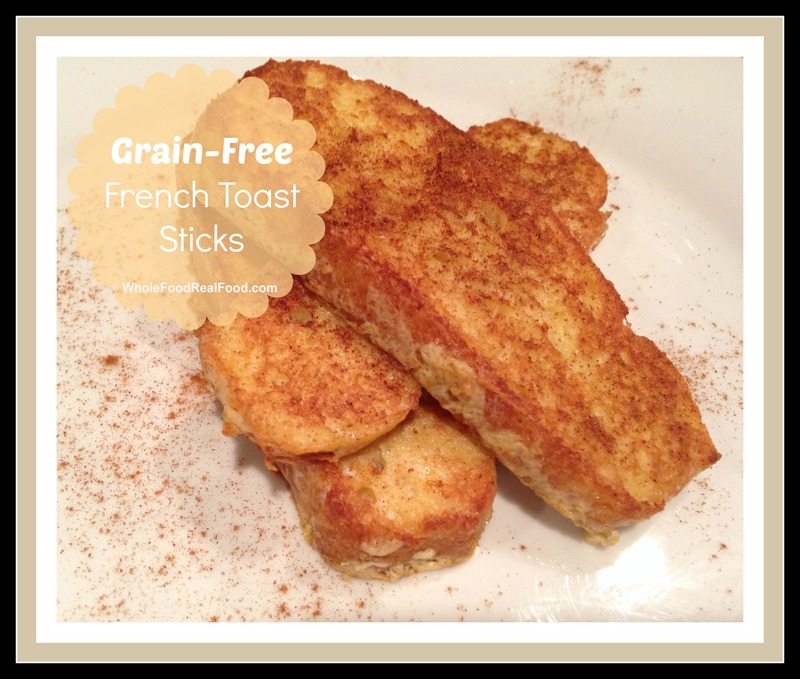 My kids love french toast sticks and I always used to buy the Farm Rich brand of frozen french toast sticks for a fun breakfast. 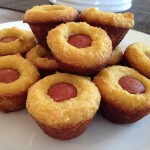 Once I started paying attention to ingredients I was disgusted when I realized what I had been really feeding my kids. Following is the ingredient breakdown of Farm Rich french toast sticks (filled with GMOs). This ingredient list upsets me too because a lot of schools serve these sticks, not necessarily this brand, which likely contain close to the same ingredients. Ingredients: Bread (whole wheat flour, water, enriched bleached flour [wheat flour, malted barley flour, niacin, iron, thiamine mononitrate [vitamin B1], riboflavin [vitamin B2], folic acid), high fructose corn syrup, east, wheat gluten, vegetable oil [soybean and/or cottonseed oils], contains 2% or less of each of the following: calcium sulfate, salt, yeast nutrients [monocalcium phosphate, calcium sulfate, ammonium sulfate], dough conditioners [may also contain one or more of the following: mono- and diglycerides, ascorbic acid, enzymes, azodicarbonamide], corn starch, calcium propionate [preservative], guar gum, niacin [vitamin B3], pyridoxine hydrochloride [vitamin B6], riboflavin [vitamin B2], thiamin mononitrate [vitamin B1], vitamin A palmitate, calcium, reduced iron, vitamin D3, soy lecithin, soy flour, water, soybean oil, enriched bleached wheat flour (flour, niacin, reduced iron, thiamine mononitrate, riboflavin, folic acid), yellow corn flour, contains 2% or less of each of the following: cinnamon, dextrose, food starch-modified, salt, methylcellulose, gelatinized wheat starch, dried whole egg, leavening (sodium bicarbonate, monocalcium phosphate, sodium acid pyrophsophate), soy lecithin, dried whey, paprika extract, soy flour, polysorbate 80, nonfat dry milk, spice extracts, wheat flour. Contains: Wheat, soy, egg, milk. Azodicarbonamide is often found in store-bought breads and breads at fast food chains. It is a chemical whose primary use is in the production of foamed plastics and and the manufacture of gaskets. In the United States it is also used as a food additive and flour bleaching agent. In the UK, the H.S.E has identified azodicarbonamide as a respiratory sensitiser (a possible cause of asthma) and determined that products should be labeled with “May cause sensitisation by inhalation.” (Source) It is banned as a food additive and in food packaging in the United Kingdom. It is also banned in most European countries as well as Australia. And its use in Singapore has some pretty severe penalties (up to 15 years in prison and $450,000 fine). The following fast food chains use azodicarbonamide in their bread: McDonalds, Burger King, Subway, and Kentucky Fried Chicken. To protect you and your family, here is a guide that details which bread products contain and do not contain azodicarbonamide. Needless to say, I wanted to find a nutritious version of this breakfast staple. These turned out so well, my 4-year-old had them for breakfast and lunch today. My picky husband even commented on how good they were and was surprised when I told them I used grain-free bread. I started with a loaf of nut-free, grain-free bread, which I made the night before to save time in the morning. 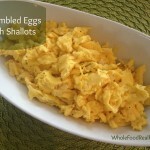 The recipe comes from The Paleo Mom, whose blog I suggest following… this mama knows her stuff! I used a 9-by-5 inch loaf pan to get the bread to bake the size of sticks. If you want regular size pieces of bread, 7.5″x3.5″ loaf pan will do the trick. When serving this french toast, it is important to use real maple syrup. There are two varieties of maple syrup to choose from, USDA Grade A and Grade B. Grade A is the most popular, with a light maple flavor and a relatively thin consistency. It’s a good choice for pancakes, and can make a great topping for desserts and other foods. Grade B maple syrup is much darker and has a stronger flavor. 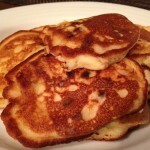 It also is a bit thicker, tending towards the consistency of pancake syrup rather than the runnier Grade A. Grade B is often recommended for baking because its stronger flavor comes through more readily, but it can be a better choice for pancakes or waffles than Grade A if you are a fan of the flavor of maple in general. The two are interchangeable as far as what will work in a recipe that calls for maple syrup. Grade C maple syrup, it is now called Grade B. Thus, Grade B & C are the same. 100% Pure Organic Maple Syrup is an excellent source of manganese and a good source of zinc. The trace mineral manganese is an essential for energy production and antioxidant defenses. Zinc and manganese are also important allies in the immune system. Most traditional pancake syrups contain added salt, corn syrup, high fructose corn syrup and sodium benzoate. Both corn syrup and high fructose corn syrup are potential GM (genetically modified) ingredients. These are really good, I hope you enjoy them! Preheat oven to 350F. Grease a 9"x5" loaf pan with ghee or coconut oil. Melt the butter, ghee or coconut oil and let cool slightly. Beat eggs in a blender or food processor until frothy, about 30 seconds. Add the remaining ingredients and process again until smooth. Let the batter sit for a minute to thicken. Pour batter into prepared loaf pan. Spread it out so that the surface is even. Bake for 35 minutes. Melt butter, ghee or coconut oil in skillet. Mix eggs, milk and vanilla in bowl. Brown the soaked bread in skillet. Sprinkle with cinnamon and serve with maple syrup. 1. Preheat oven to 350F. 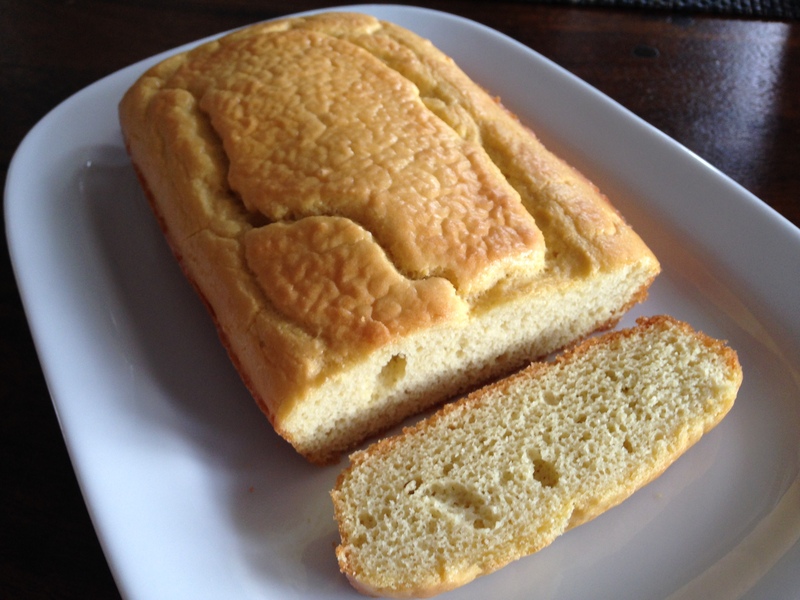 Grease a 9″x5″ loaf pan with ghee or coconut oil. 2. Melt the butter, ghee or coconut oil and let cool slightly. 3. Beat eggs in a blender or food processor until frothy, about 30 seconds. Add the remaining ingredients and process again until smooth. Let the batter sit for a minute to thicken. 4. Pour batter into prepared loaf pan. Spread it out so that the surface is even. Bake for 35 minutes. 5. Melt butter, ghee or coconut oil in skillet. 6. Mix eggs, milk and vanilla in bowl. 7. Soak slices of bread. 8. Brown the soaked bread in skillet. 9. Sprinkle with cinnamon and serve with maple syrup. Wow these look delicious! My kids love French Toast so I will have to try these. I hope you enjoy them, Courtney! I made these this morning and they were very good. I baked the bread yesterday evening, let it cool a bit, cut it into slices, and then put the slices in the warm oven overnight so that they wouldn’t be so moist and could soak up the egg/milk mixture the next morning. I only used 2 eggs and 1/3 cup almond milk, 1t vanilla, and put a lot of cinnamon in. They were the closest to “real” french toast” that I’ve had since removing grains from my diet a few years ago.